Local health campaigner Elaine Clark, who was chair of the Improving Patient Experience Group (IPEG) for seven years, has stood down. Elaine stepped down to focus on her role as Patient Experience Lead for our Outpatients’ department. Read " Patient group lead stands down to focus …"
Today’s (7 April) World Health Day, run by the World Health Organization, is focusing on diabetes, to raise awareness of the condition, and how to beat and treat it. We look after a population of 750,000 people, of which 33,000 are known to have diabetes. We care for patients with both type one and type two, as well as other rare types of diabetes. Read " World Health Day – Beat Diabetes…"
Queen’s Hospital has had its first feline visitor, as staff made sure the last wish of a dying patient came true. Cat lover Gladys Wray, 66, died of lung cancer at the Romford hospital and it was feared her last wish to see her cat again could not come true. 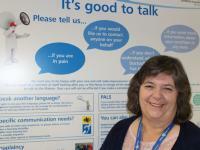 Read " Cat brought to hospital to say goodbye t…"
Today sees the launch of our first ‘Let’s Talk Improvement’ month. Together with input from our patients, partners and stakeholders, staff have been working hard to continually better our care. So we’ve dedicated April to talking about the improvements we’ve made across our hospitals. Read " Let’s Talk Improvement…"